Last weekend was a very special weekend for me. 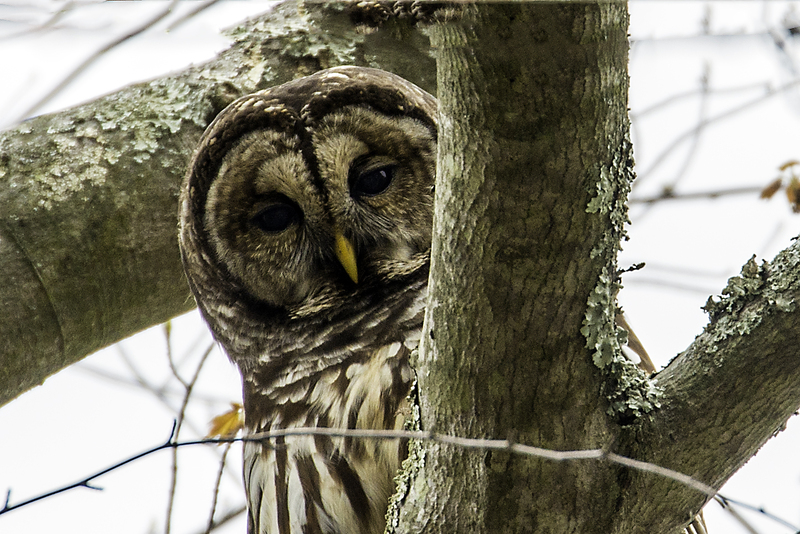 Special, because I was able to see, hear and photograph a pair of Barred Owls, and Owls are my favorite bird species. Throughout history and across many cultures, people have regarded Owls with fascination and awe. Few other creatures have so many different and contradictory beliefs about them. Owls have been both feared and venerated, despised and admired, considered wise and foolish, and associated with witchcraft and medicine, the weather, birth and death. So, I am not alone in my fascination with Owls. For me, the problem with Owls has been finding and photographing them in the wild, that was until this weekend. However, I have previously photographed a Great Horned Owl and a Galapagos Barn Owl. Owls can be difficult to photograph because they are mostly nocturnal. 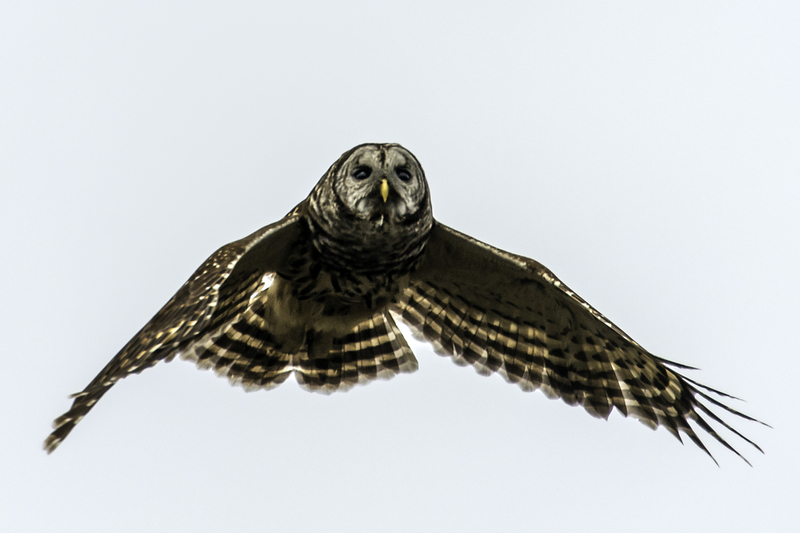 That was different for me this weekend, when I found a pair of Barred Owls in the late afternoon. What also made it very special was that they were not afraid of me, and I was able to get several very good photographs of them. The opening image was taken during one of the many times the Owls flew directly and closely over me. The area where they were located was heavily wooded, a perfect environment for the Owls, but difficult for me to get a clear shot at them most of the time. While I was photographing them, they put on quite a show flying all around me, landing in various trees and hooting loudly. 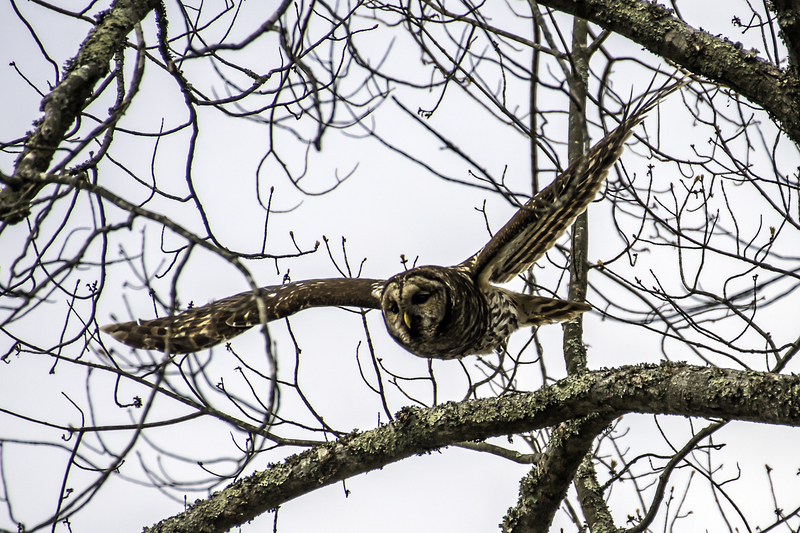 Barred Owls do not migrate and typically live in wet woods and swampy forests, which is where I found this pair. They are about 20 inches in length, and from my images you can see that they are large, stocky and dark-eyed. They nest quietly during the day, and emerge at night to hunt rodents, birds, frogs and other small animals or sometimes fish. I believe I also found their nest, which is a large cavity in a big old tree. The female will most likely be laying 2-4 eggs that will hatch in about 4 weeks. During that time, the male will do all the hunting and return with food for the female, and eventually for the owlets. The owlets will fledge in about 4-5 weeks. I hope to be able to photograph them as they raise their young. If I am successful, I will be posting the images on this blog. By the way, this was also the first real test for my new Nikon D800 camera body, and I am very pleased with its performance. Unfortunately, it was late afternoon on a very overcast day (poor light), and I traveled light, not knowing what to expect, bringing only my versitle 28-300mm lens. Next time, I will be better prepared and hopefully will have better light. 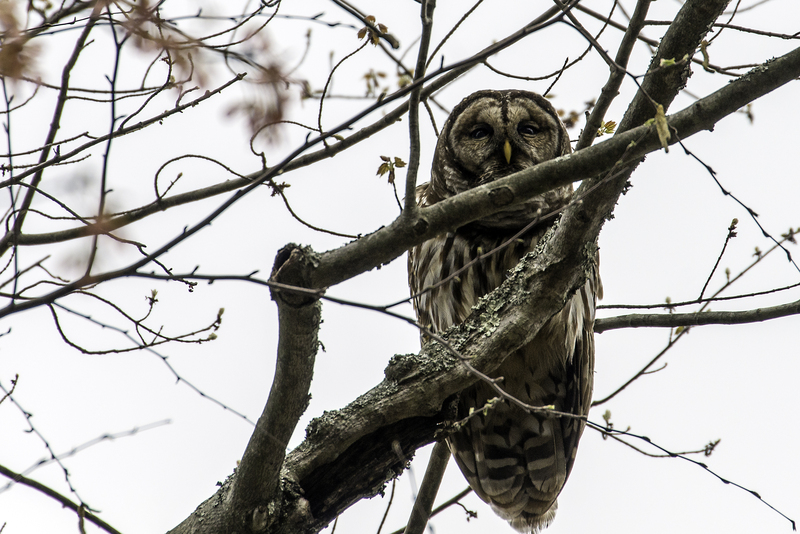 But even if I do not ever see that pair of Barred Owls again, I am very thankful for that opportunity and still excited from the experience. 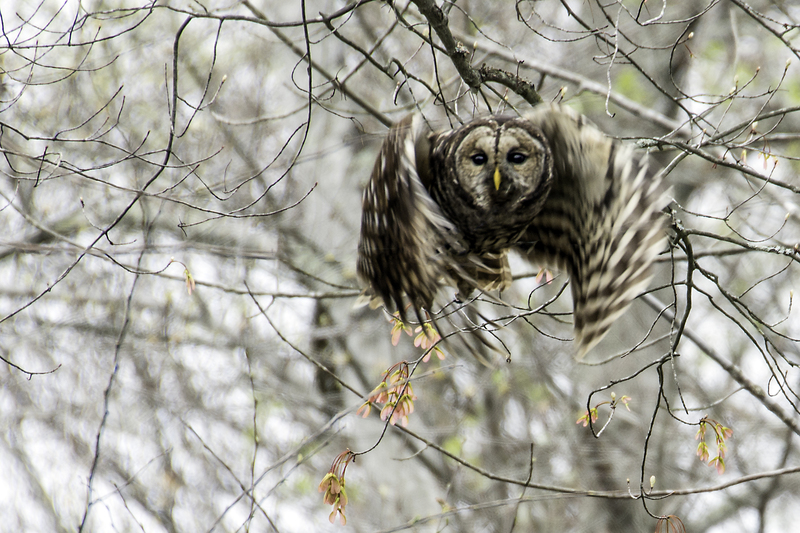 This entry was posted in Bird Photographs, Nature, Wildlife and tagged Barred owl, nature, Nikon D800. Bookmark the permalink. Incredible shots and description. I myself have never seen any owls in my life. I feel really fortunate to see the wonderful pictures of owls and read your article. The other day I went to Leesylvania state park but it was overcast as well as somewhat late to take any good sunrise pictures.. so I turned around and promised myself to visit the park sometime in the near future. You should bring peace offering for them in shape of a rat or something. I only saw an owl once in all its full glory. As I pulled in into driveway after being absent for three weeks I saw in the beam of my car’s headlights, a gigantic owl taking off. It was powerful. I don’t know what species it was…The moment was short but it had my adrenaline going. Thank you Barbara–They are incredible birds, and my adrenaline was going that day too. I am challenged trying to capture a cardinal in the backyard, so I can’t imagine how difficult it was to take these amazing pictures! 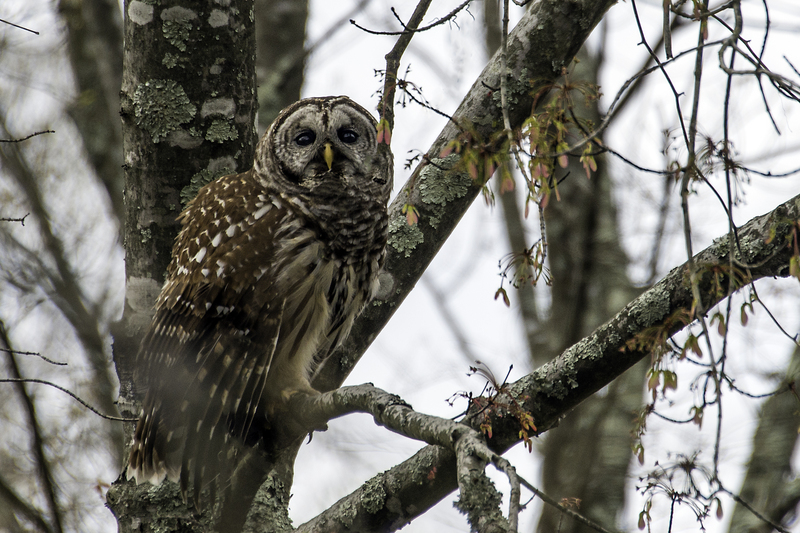 Such a treat….I don’t think I’ve ever seen an owl of any kind in the wild. How is that possible? Thanks again for sharing you incredible work! Thank you for your wonderful comment. 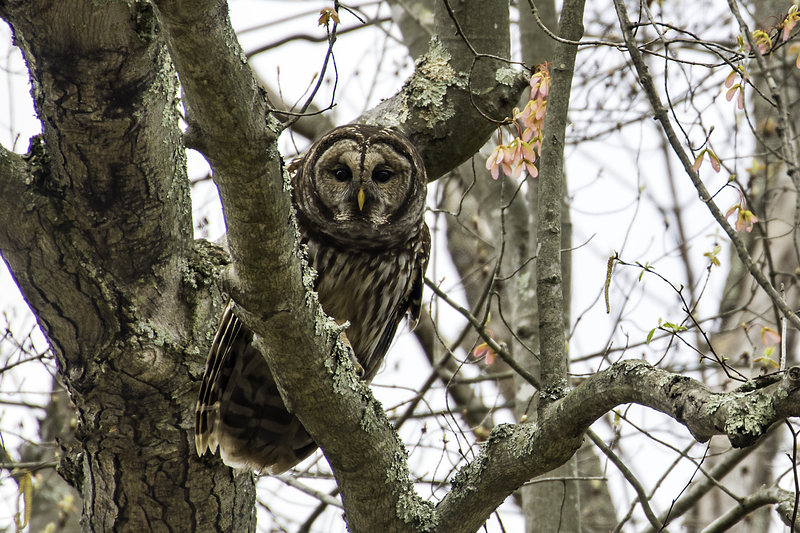 It was a challenge beyond what I described in my article because I was in my kayak at the time when I was observing the owls and trying to shoot the pictures. And as you probably know, kayaks are not very stable and constantly moving. Amazing owl photos. Thanks for bringing me up close to nature. I’ve never seen owls in the wild, only in zoos or at presentations by someone who rehabilitates injured birds. Your photos are incredible, and I’m glad for the opportunity to see them through your lens! Well done! Thank you for taking the time to comment. I was out today photographing them again. The female is on the nest! Hopefully, there will be owlets in future blog posts. Thank you Debbie for the comments and for for saving the owl and other birds. Let me know if I can be of any assistance.